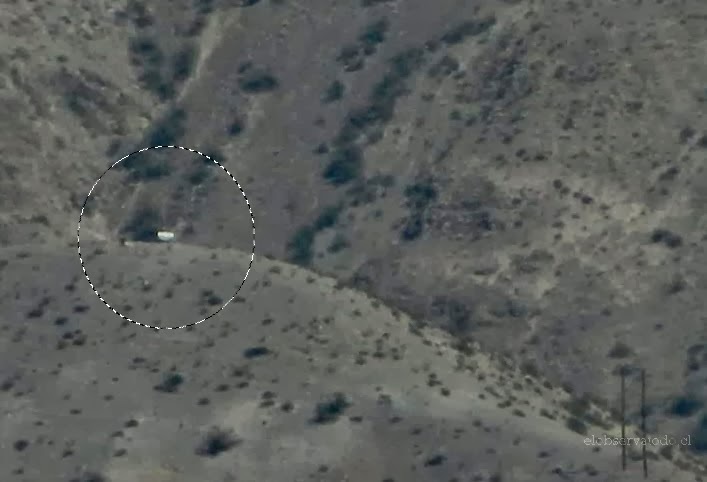 Resident of Vicuña and Valle del Elqui say that the object fell in a hill after zig-zagging for a few minutes. Several residents of Vicuña and vicinity have reported the collision of a hitherto unidentified flying object in a hill near Vicuña, in the interior of Valle del Elqui. According to eyewitnesses, who took the photograph attached to this story, the event occurred around 16:00 hours on Sunday when an object - flying at considerable altitude - zig-zagged for a few minutes before plummeting into a hill in the sector known a La Compañía. A worker at a Vicuña hostel (who requested confidentiality) stated that "[the object] made several turns in the sky until it began to lose altitude and fall on top of a hill. People began climbing the hill just to see it, but it's rather far away. It's about the size of a railcar." The photograph shows an object that shines in the sunlight, suggesting that it could be a metallic object or some sort of weather balloon. It should be noted that this is not the first time that Valle de Elqui has reported UFO sightings. The most spectacular case was the alleged crash of a UFO in Paihuano, which has been studied by a number of ufologists, although there is no record of the object in question.